At BKOM STUDIOS, we believe that a smooth and effective user experience is key in achieving success. This is why our team of experienced UX specialists and UI designers make sure to cover all strategic and technical aspects leading to the creation of enjoyable and easy-to-use interfaces. Whether you need a full-service studio for your game, website or app, or you’re looking for UX/UI design services for your own projects, BKOM Studios’ in-house experts are ready to help you achieve your goals! Each new project must start the right way with a detailed user experience analysis. This includes a review of key competitors, industry benchmarks and best practices. The analysis documents include a detailed description of each screen, functionality, options and outcomes that users will encounter, as well as an analysis of comparable projects on the market. From ideas, we create concrete user experience solutions. Based on the UX Analysis, we create wireframe layouts of all of the key pages and screens and show how users can navigate between them. This allows stakeholders to validate the UX approach. It also provides UI designers and integrators with concrete and detailed instructions to work from. An interactive prototype will bring the wireframes to life by simulating the navigation and key features, such as forms, using HTML. Based on the material provided by the UX specialists, User Interface designers will research similar products on the market and look for inspiration from various sources. The resulting mood boards will be used to spark their creativity and validate the general art direction with the stakeholders. Our award-winning UI designers use the approved wireframes to create the user interface comps. When possible, BKOM uses a “mobile-first” approach, designing responsive layouts that adapt to the wide variety of screen sizes and shapes on the market. 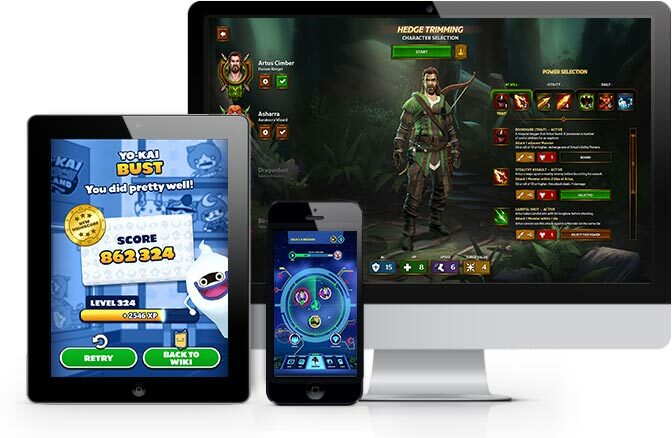 In the case of Unity-based projects, such as mobile/PC games and apps, our UI designers will integrate the assets directly into the development tool, speeding up the process and ensuring a rigorous implementation of the approved layouts. For other types of projects, our UI designers will prepare the visual assets according to the technical specifications provided by the developers.